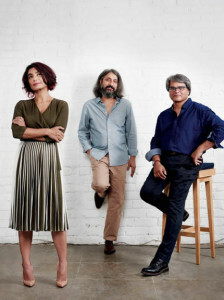 “The Yokohama Triennale has named Raqs Media Collective, the New Delhi–based group formed in 1992 by Jeebesh Bagchi, Monica Narula, and Shuddhabrata Sengupta, artistic director of its seventh edition, which will open in July 2020. Raqs is known for producing work across a range of media that often explores the intersection of art, philosophy, and historical inquiry. Among the collective’s recent curatorial projects are “In the Open or in Stealth: The Unruly Presence of an Intimate Future” (2018–19) at the Museu d’Art Contemporani de Barcelona; the Eleventh Shanghai Biennale (2016–17); and “INSERT2014: The Sharp Edge of the Global Contemporary” (2014) at the Indira Gandhi National Centre for the Arts in New Delhi. This entry was posted in Raqs Media Collective and tagged Raqs Media Collective, Yokohama Triennale. Bookmark the permalink.